Featuring a variety of expert speakers, product demonstrations, training sessions, networking opportunities, and more, the Zoholics conference is the biggest event of the year for companies looking to get the most out of the Zoho suite of apps. This year’s conference promises to be the biggest annual event yet, taking part in Austin, Texas at the sprawling Palmer Events Center between Tuesday, April 9th and Thursday the 11th. Zoho’s latest annual event has been designed to be the biggest conference in the company’s history, with more than 1,500 attendees gathering at the Palmer Events Center in Austin, Texas. Zoholics 2019 will focus on more than purely Zoho developers and sales & marketing, instead serving as a showcase for the Zoho One suite of apps and focusing on all areas of business. With a bigger event comes exclusive speeches from industry thought leaders, panel discussions featuring prominent members of the Zoho team, and training sessions focusing on a wide number of topics. Attending Zoholics 2019 gives you the opportunity to interface one-on-one with a wide variety of industry experts, network with Zoho consults and implementation and integration from companies like ion8, and gain hands-on experience with Zoho One’s 40+ applications. A number of exciting speakers are scheduled to present at the event, including Sridhar Vembu, CEO & Co-Founder of Zoho, Vijay Sundaram, Chief Strategy Officer, Paul Greenberg, Founder & Managing Principal at The 56 Group, and Ray Wang, Principal Analyst, Founder and Chairman at Constellation Research Inc. Your business works best when members of your team are unified in an all-in-one solution that gives them the tools needed to succeed. Zoho One is an advanced suite of more than 40 integrated productivity apps, allowing every single department of your business to truly thrive. With Zoho One, your marketing, sales, accounting, and other important departments are connected to one another, no matter what tool they’re using to get the job done. Whether it’s Zoho’s famous customer relationship management (CRM) solution, or apps like SalesIQ, Zoho’s customer conversion tool, Zoho One has every aspect of your business covered, from productivity and collaboration to finance, human resources, and marketing. As a Zoho Advanced Partner, ion8 is a leader in all things Zoho One consultation, implementation, and integration, with a team, made up of industry experts with years of combined experience under their belts. Whether your business wants a clean and simple implementation, or you need a custom-tailored Zoho One experience that fits the unique needs of your business, the ion8 team is ready to take on projects of any size and scope. In addition to featuring a team of Zoho One experts, ion8 is also home to a wide variety of services that will help propel your business to the next level. Our team includes experienced web designers and developers, human resource managers, digital marketing experts, cloud communications consultants, and much more. We are also a Google Partner, and a licensed consultant for digital solutions including G Suite, Clio, Shopify, and VoIP technology including RingCentral and Vonage Business. 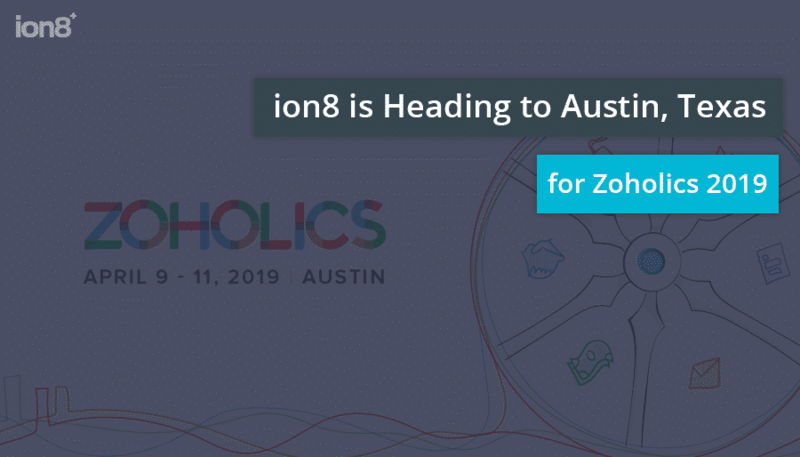 ion8 is proud to be attending Zoholics 2019 in Austin, Texas. Stop by our booth from Tuesday, April 9th until Thursday, April 11th to speak to our team of Zoho One consultants and integration experts. To find out how ion8 can positively charge your business through effective digital strategy implementation and software and communication solution implementation, contact ion8 today. Previous Post Do You Have a Zombie Website? Give it Brainnnnssss….